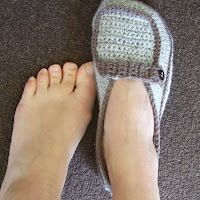 Today I designed some new slippers...the ladies version of my side-button loafers. I used some DK weight cotton/acrylic blend yarn in a heather gray with a mocha brown trim. Someone asked me yesterday to design the adult version of my side-button boots...so I may do that at some point. Next on the to do list...make some slippers for a friend who has been patiently waiting and finish a scarf for my sister before the weather gets too chilly in Toronto. Oma...good things come to those who wait...I haven't forgotten about you. So, can a walking child still wear a shoe made of yarn? Will it run a hole real fast? They're fine on carpet - they don't get holes, but using a good quality cotton is a good way to keep them from getting worn or too felted on the bottoms. I recommend adding sherpa suede to the soles for wear outdoors or on slippery surfaces. My daughter wore her little sherpa soled shoes all the time.